The Canadian Clay and Glass Gallery in Waterloo, ON, will celebrate Alwyn O’Brien and her work, and present to her the 2015 Winifred Shantz Award on Saturday, November 14. O’Brien received her MFA in 2010 from the University of Washington in Seattle and her BFA from Emily Carr Institute. Her work is featured in the collections of the Seattle Art Museum, the Surrey Art Gallery, and the Mackenzie Art Gallery. She divides her time between Saltspring Island, B.C. and Vancouver, where she is currently an instructor at both Emily Carr University of Art and Design and Langara College. Alwyn will receive $10,000. This prestigious national awards allow early career practising ceramic and glass artists to undertake a period of independent research, or other activities that will advance their artistic and professional practice at a key moment in their careers. 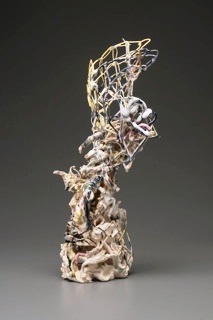 This entry was posted in Award, British Columbia, Ceramics and tagged Alwyn O'Brien, canadian clay and glass gallery, winifred shantz award on November 6, 2015 by Barry Morrison.